On May 12, 1898, the Democratic Party of North Carolina held its first campaign rally in Laurinburg N.C. Following the procession of a band and parade, the rally featured speeches by two major Democratic politicians, Locke Craig and Charles Brantley Aycock. As the headlines of the Raleigh New and Observer suggested, the Democrats made white supremacy and the free coinage of silver the focal points of the Democratic campaign. Following the campaign, Aycock became the 50th Governor of North Carolina in 1901. Craig was elected to the North Carolina House of Representatives in 1899 and 1901. He too served as the Governor of North Carolina from 1913-1917. "Grand Democratic Rally," North Carolina Collection, University of North Carolina at Chapel Hill, accessed February 4, 2012, <http://www.lib.unc.edu/ncc/1898/sources/rallyimage1.html>. Join in the Commencement of a Campaign that is to Enthrone the White Man and the White Metal. ---To-day has been a great day for the Democracy in old Richmond. In the work preparatory to the grand Democratic rally no stone had been left unturned to meet the success which today crowned our efforts. Although the crowd, large as it was, did not quite come up to our expectations, yet it was not lacking in enthusiasm and in it could be seen white men of every political shade of belief, men in hearty sympathy with the doctrines that were being enunciated by the two leaders of the Democracy in North Carolina. First the band wagon followed by a bicycle parade, then came the mounted horsemen under management of Chief Marshal T.C. McEachin, and last but not least in company with Walter H. Neal, and the orators of the day. Upon arrival at the stand which had been tastefully decorated by our ladies, Mr. Neal in a few well chosen words, introduced the first speaker, Hon. 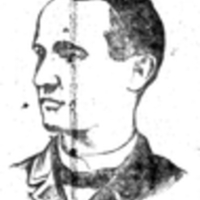 Locke Craig, of Asheville. To apreciate Mr. Craig one must hear him. His speech from beginning to finish was a masterpiece of oratory. He was introduced as the silver tongued orator of the West, and he richly deserves the title. Most powerfully did he expose the treachery and misrule of Republicanism in both State and nation. Perhaps his strongest point was his appeal "not to desert the battle-scarred ship of the Democracy. Go to Hampton Roads after the was is over and the ships are coming in. You see one tattered and torn. Before condemning her ascertain what she has been through. When you find that she has been through many storms and tempests and has been the target for the enemies on the high seas, she will them command your confidence and admiration. "The grand old Democratic ship has been exposed to ruin by her treacherous leader. Her great captain, Grover Cleveland, backed up by the money sharks of Wall street, deliberately steered her upon the quicksands and the rocks; and when we could stand it no longer we tossed him overboard. In 1900 we place in the great pilot house of the nation, the author of that famous sentence, 'You shall not press upon the brow of labor this crown of thorns.'" Following Mr. Craig was the "idol of the East," C.B. Aycock, of Wayne. This gentleman is a power "on the stump." He confined himself principally to Republican misrule in North Carolina. He emphasized the necessity of unifying the white forces before we can hope for the restoration of white supremacy in North Carolina. His invitation to white men to return to the fold was most impressive. It is the privilege to return as co-worker with us. "The Southern States seceded from the Union and remained out during four long years of bloody battle. When we returned we returned as co-equal States and not as conquered provinces, and to-day it is our flag and our union. So it is the privilege of the Populist, sick of the existing state of affairs, to return as co-equals and co-workers. He referred to the war, but declared of more vital importance to North Carolinians than the Spanish-American war, is the redemption of North Carolina. He appealed to white men of all shades of political faith, men who love their wives and daughters and revere their mothers, to come together at the polls in one unbroken phalanx for the accomplishment of this glorious purpose. We feel that our efforts have not been in vain and that they will be productive of great good to the people of our county and State. Raleigh News and Observer, "Grand Democratic Rally," Raleigh News and Observer, May 13, 1898, Civil War Era NC, accessed April 24, 2019, https://cwnc.omeka.chass.ncsu.edu/items/show/63.